Welcome to study the divine patterns of the Universe! Everything in the manifest world is based on the Divine patterns of Creation known as Sacred Geometry. Formerly Sacred Geometry was a secret topic restricted to closed groups of spiritual initiates, only in the past 100 years has the veil begun to lift. Much more than "symbolic" patterns of art and philosophy, the true science of Sacred Geometry allows direct, practical access to spiritual and material forces of creation. Sacred Geometry means literally “the Sacred Measure of the Earth.” It has been taught as a powerful, practical spiritual science to closed groups of Initiates in every great spiritual tradition of the world. Sacred Geometry holds the keys to how non-physical Spirit creates the manifest world through specific patterns, each of which creates specific functions of Life or Consciousness. Sacred Geometry provides a solid foundation for both Scientific and Spiritual Knowledge. Every pattern in Sacred Geometry is like a “Letter” in a “Divine Alphabet”; every pattern creates a specific function of Life and Consciousness. We can learn to read these “Letters” (patterns) and then ‘spell words’ with these divine creative forms. In other words, we learn to read in the book of nature and use spirit’s own language of sacred geometry to create optimal effects in any work we undertake. Sacred Geometry allows us to directly understand the “geometric coding system” that Spirit uses to manifest all Life and Consciousness. It gives us vital insight into the foundations of both spirit and matter, insights which can be applied in both spiritual and scientific pursuits. It also allows us to heal the painful split between spirituality and rational, scientific understanding which so afflicts our modern society and our own soul life. Sacred Geometry has been taught for millenia to Spiritual Initiates in multiple spiritual traditions around the world for a very good reason: it can be applied to transform our own life energy, consciousness, and the world around us in the most beneficial ways possible. In fact, one reason that the previously secret teachings of Sacred Geometry are now being made publicly available (by multiple spiritual traditions) is so that the knowledge can be applied to help heal ourselves and our planet. You need to be a Seeker of Sacred Geometry to add comments! Greetings and salutations to you all, I'm here to learn, any assistance you can give will be greatly appreciated. 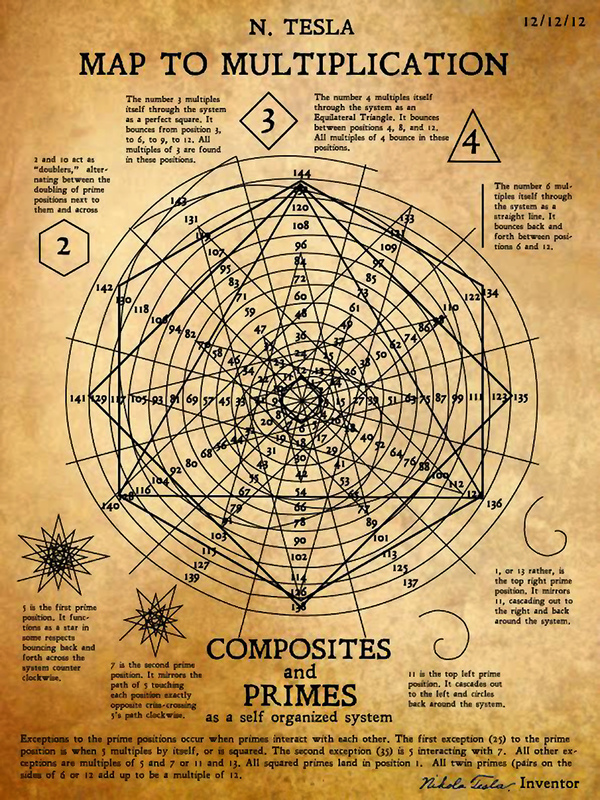 Nicola Tesla had a map to multiplication. Here was an open perceptive being. I am just now learning about all of this. It is really cool stuff. I love learning about the interconnectedness of 'it all'. Squaring the circle from within the Fruit of Life. Frequencies Sound + Vibration = Sacred Geometry! Displays the sound using different speed/frequencies changing into Secret geometry.....Using Sand...Ancient Knowledge is coming BACK! Hey guys, If you want to create the Platonic Solids yourself, here are the models you can download and print. A good material you can use is thick paper (color of your choice). Have fun! 8.Continue until you have a star tetrahedron. Taken from “The Ancient Secret of the Flower ofLife,” Vol. 2, by Drunvalo Melchizedek. Note: This will take concentration, so don’t be discouraged.